Today I'm sharing three easy ground beef freezer casseroles with you. I like to buy organic meat in bulk and cook up the entire batch. Sometimes I'll make 3 of the same dish (last month I made three shepherd's pies), but today I am making three different casseroles, and they are all delicious and family friendly. First, I cooked up a large batch of ground beef, around 4 1/2 lbs (this is the three-pack of organic ground beef I buy at Costco). I cooked the ground beef with chopped onion. Once the meat is cooked, I drain the fat. Then I add several cups of greens (spinach, swiss chard and kale). I also added shredded carrots and seasoned this with garlic salt. I then cook the mixture about 5 minutes longer to cook down the greens. 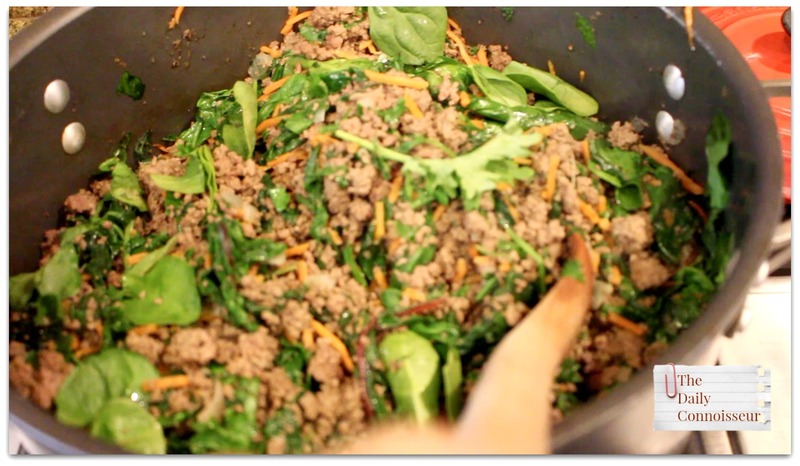 Feel free to add whatever vegetables you have on hand to your meat base mixture. I also cooked around 8 cups of brown rice in my rice cooker. Once you prep these two steps, you are ready to assemble your casseroles. If you plan to freeze your meals, check out these aluminum foil casserole dishes. The rice cooker I use is by Hamilton Beach. I use it to cook up to 8 cups of rice. I go through a lot of panko bread crumbs. Here is a link to a 6-pack of panko bread crumbs on Amazon. I also go through a lot of diced green chiles in my cooking, here is a link to a 12-pack of mild chiles on Amazon. Mix your cooked beef mixture together with the bell peppers, tomatoes, and brown rice over medium heat. Cook until the peppers are less crunchy, around 5 to 7 minutes. Remove from the heat and add the cheese. Pour into a casserole dish. Top with the panko bread crumbs mixed with olive oil. If you are going to serve this tonight, cook at 350 degrees F for 8 to 10 minutes. 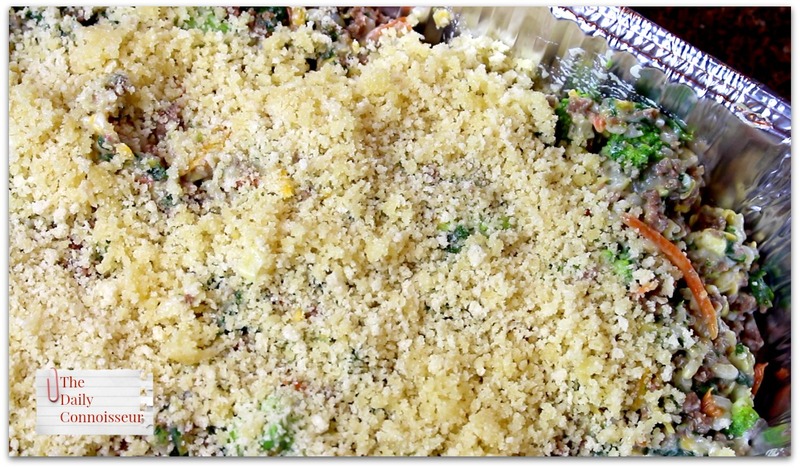 If you are going to freeze this meal, cover and label your casserole dish or foil baking dish. When you are ready to serve it, you can either defrost it in your refrigerator overnight, and cook it at 350 degrees F for around 60 minutes, or if you are cooking this from frozen, you can cook at 350 degrees F for around 1 1/2 hours to 1 hour 40 minutes. Please note that all ovens are different and your cook times will vary. 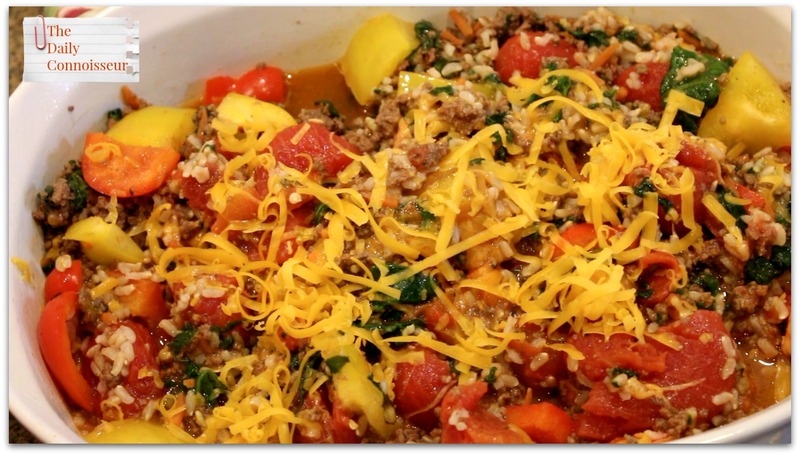 In a large bowl, mix the cooked beef mixture with the cooked brown rice, chiles, olives, corn, sour cream and cheese. Save some cheese to sprinkle on top. If you are eating this tonight, cook at 350 degrees F for 25 to 30 minutes. If you plan to freeze this, cover and label your casserole in your casserole pan or foil baking dish. If you plan to defrost the casserole before cooking, you will cook it at 350 degrees F for around one hour. If you plan to cook from frozen, you will cook at 350 degrees F for 1 1/2 to 1 hour and 40 minutes. Combine the beef, brown rice, broccoli, corn, broccoli soup, milk, and cheddar cheese. Stir to combine. Place in a casserole dish and top with the panko bread crumbs. If you are eating this tonight, cook at 350 degrees F for 25 to 30 minutes. 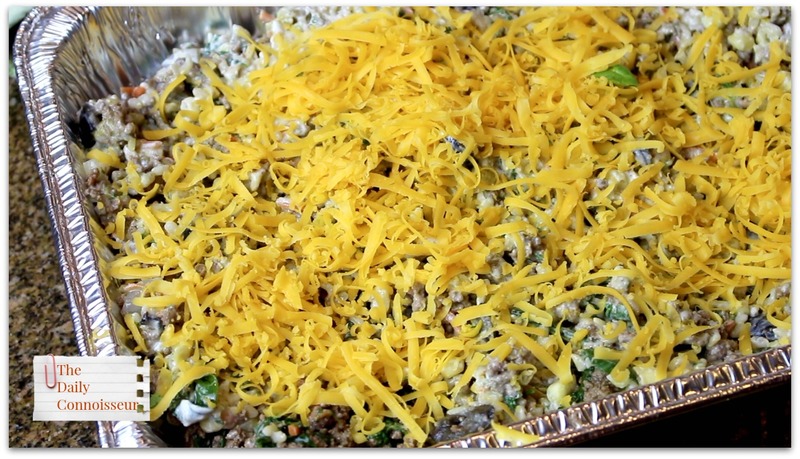 If you plan to freeze this, cover and label your casserole in your casserole pan or foil baking dish. If you plan to defrost the casserole before cooking, you will cook it at 350 degrees F for around one hour. If you plan to cook from frozen, you will cook at 350 degrees F for 1 1/2 to 1 hour and 40 minutes. I hope you enjoy today's video. 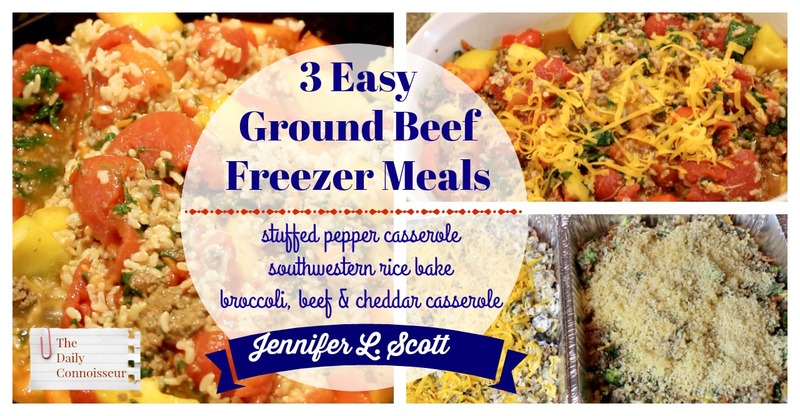 For more inspiration for my past freezer meal blogposts, click here. On one of the course videos on the Debt-free living course, Sheena writes, "This was my favorite video yet. It really helps you see whats truly important. Consumerism has taken over and convinced us that we need, need, need in order to be happy. But happiness comes with the simple things in life. Great discussion!" Regarding Monday's interview with Melissa55, Blondegirl888 on Instagram writes, "Enjoyed your interview with Melissa. I have followed her for awhile. Glad to see someone younger and older agreeing that aging does not mean you stop being interested in beauty. To me aging happens on the outside; inside we still feel youthful. It is a privilege to grow older and I feel lucky 🍀 that other women my age still want to feel and look attractive. Thanks Jennifer and Melissa for this video." Thank you for watching my interview with Melissa, Blondegirl. I love your attitude on aging, that it is a privilege to grow older. I hope you enjoy today's video and feel inspired to create freezer meals in your own home. Remember, being chic is being prepared :) Have a wonderful weekend and I'll see you on Monday! 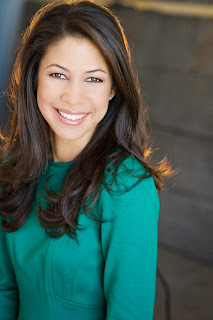 I had the pleasure of interviewing my friend, Melissa, of the Melissa55 YouTube channel, for The Daily Connoisseur. Melissa is over 60 (if you can believe it!) and has so much wonderful advice about beauty, health, and aging well. This is a nice, long, in-depth interview full of Melissa's wonderful advice. I hope you enjoy our chat as much as I did! Be sure to check out Melissa's channel and Instagram. The skincare I discuss in the video is the MyChelle sunblock stick, the Pellu Natural beauty line (formerly Nudu), and my number one tip: to not cleanse your skin in the morning. 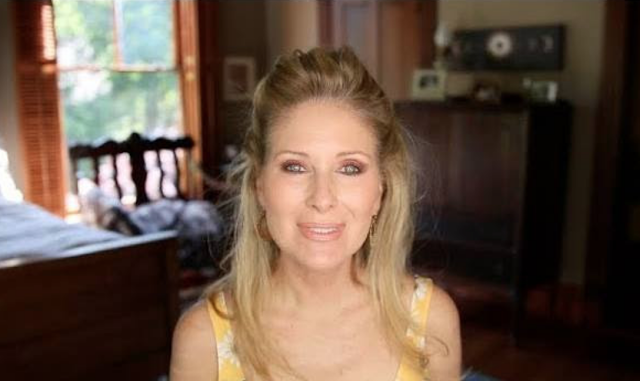 Find out what Melissa's number one skincare tip is in the video. You will be so surprised! 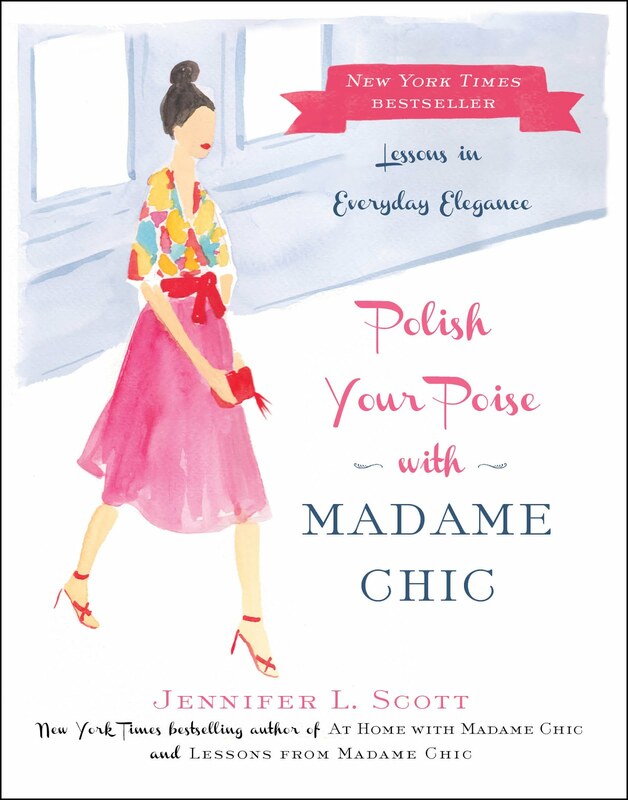 The Thai edition of Lessons from Madame Chic is now available. "Hi Jennifer, thanks for sharing. I love seeing what other people buy so much that my husband frequently tells me off for staring so much at other people’s conveyor belts in the shops that I get caught looking! I wanted to ask, what kinds of meals do you make with cauliflower rice? I’d never heard of it before and I’m intrigued. I’m British, but apparently we DO have it here too, I’ve just never known! x﻿"
Hi Jen, I often get asked about cauliflower rice. 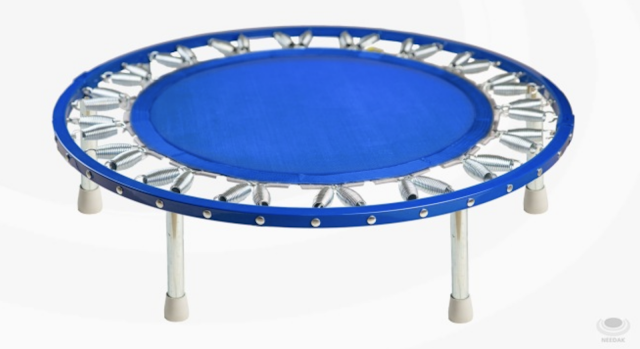 There are so many things you can do with it. It is wonderful when steamed and mashed. Served with salt, pepper, and butter, it tastes just like mashed potatoes. I also sauté it with butter and garlic, salt and pepper and serve it as a side dish. You can add it to soups to thicken them. It's very versatile. I hope you enjoyed my interview with Melissa today. What was the most eye-opening part of the interview? What is your best anti-aging advice? Let us know and your comment could be chosen as comment of the week on the blog. See you on Thursday! I have had a terrible cold this week and, as such, have a very short video and blog for you today. My Trader Joe's haul was well-received (it turns out you like knowing what other people buy at the grocery store as much as I do! ), so today I'm sharing a Costco haul with you. Why is it nice to know what other people buy at the grocery store? Because it can give you ideas for your own home-cooked meals. For our family of 5 (soon to be 6), being prepared with the right groceries is a crucial part of running a successful home. 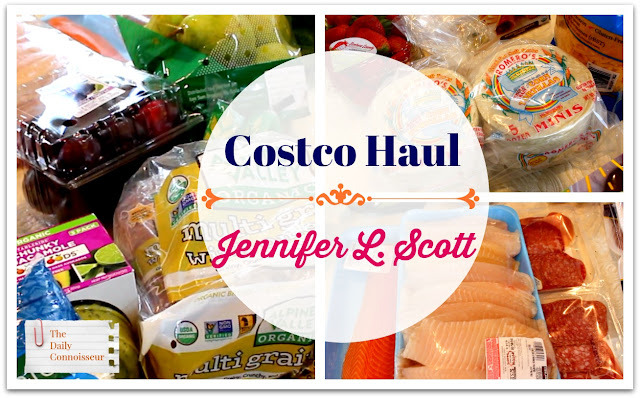 I hope you enjoy today's quick video, which shares a sample of what I typically get at Costco. I tell you what I buy, what I ended up making, and the cost of the trip. 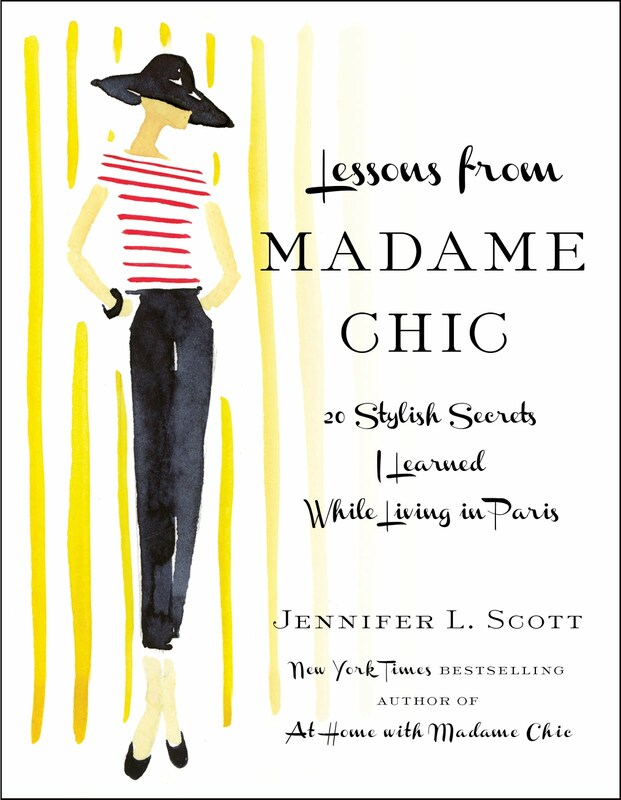 Did you know that Madame Chic shopped at a large warehouse grocery store once a month? I went with her and she loved getting items for the freezer and other bulk groceries she couldn't find from her local daily trips. For Madame Chic, a deal was a deal. In the video, I mention two new items we tried: the omega-3 bread and the chocolate banana crêpes. The bread was delicious and we loved it. The crêpes were not a big hit and we probably won't be buying them again. I don't think the kids liked the texture of the mashed banana in the crêpe. Much better to make our own. On the Ten-Item Wardrobe eCourse, Laura says, "I'm so glad I am taking this course! I have already begun to remove clothing from my closet and have taken the first pile to donation!! Feeling lighter and enjoying the freedom of saying "goodbye" !😊"
Hi Laura, I'm so glad you are enjoying the course! It is so exciting to start your own ten-item wardrobe. Thank you for joining me today. What are your favorite things to buy at Costco? Please let us know so we can get more ideas. Or if you'd like to share your favorite grocery haul items, we would love to hear those too. 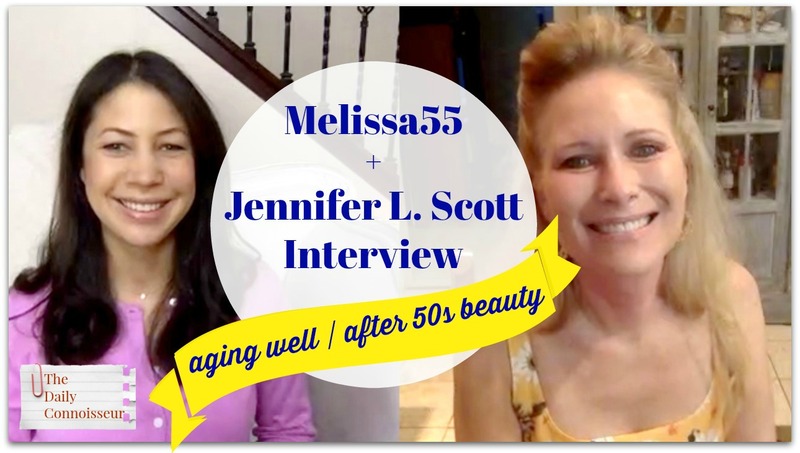 I'll see you on Monday for a wonderful interview about aging well with Melissa55. See you then! 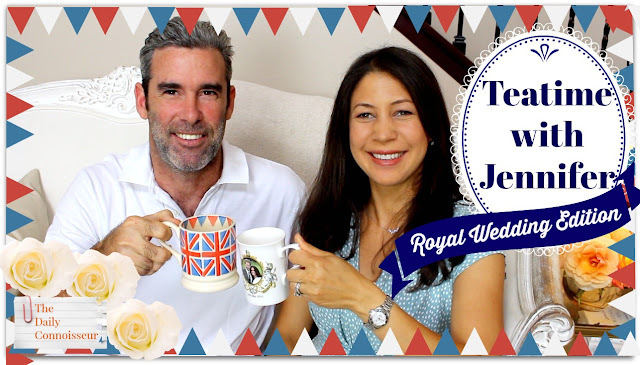 Today's Teatime with Jennifer is a special Royal Wedding edition. Prince Harry and Meghan Markle wed this past weekend at Windsor Castle in England. 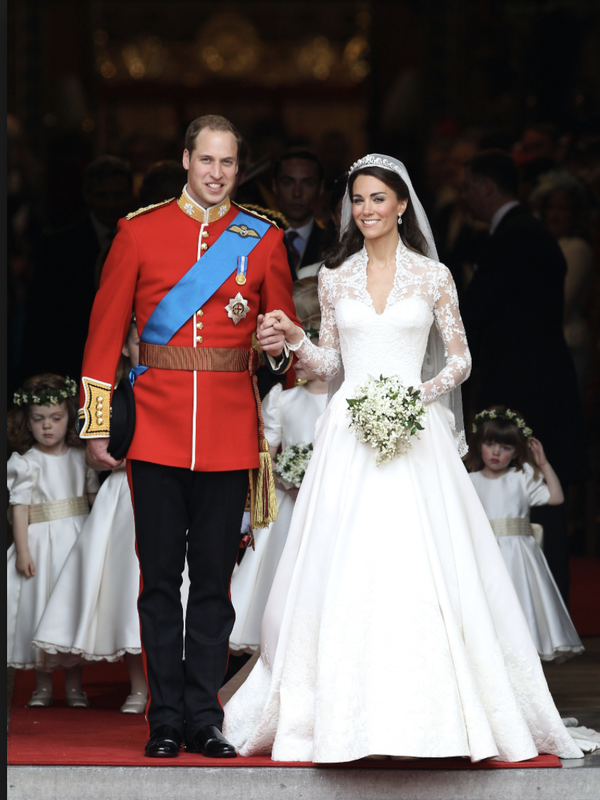 Theirs was the biggest royal wedding in England since William and Catherine's nuptials in 2011. Over 100,000 people lined the streets in Windsor to catch a glimpse at the newly married royals. In today's Teatime with Jennifer, we discuss the ceremony, the fashion, and take a look back at the most beautiful royal wedding dresses of all time. My husband, Ben, also joins me at the end for his special marriage advice for the Duke and Duchess of Sussex. I hope you enjoy today's Teatime with Jennifer video. 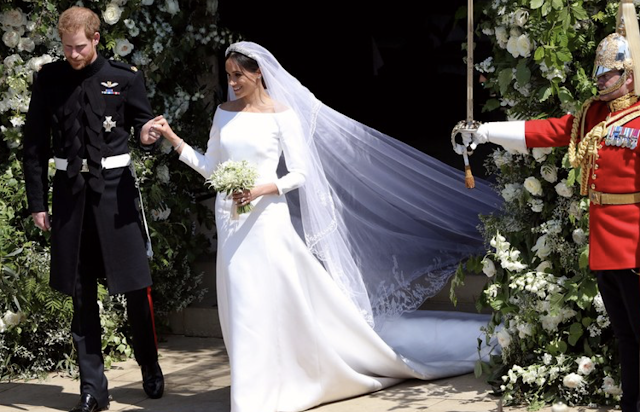 Ms. Markle wore a conservative boat-necked Givenchy gown with a dramatic veil. Let's take a look at some of the most beautiful royal wedding dresses in recent years. 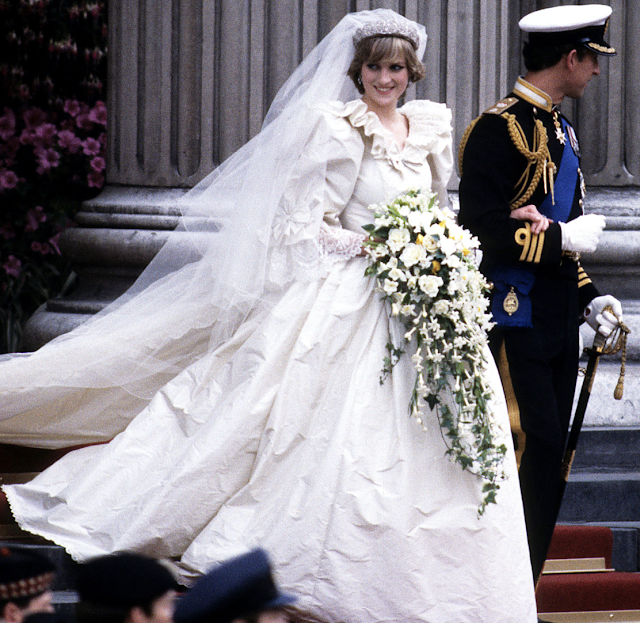 Princess Diana's ornate dress was representative of the grand 80s style. 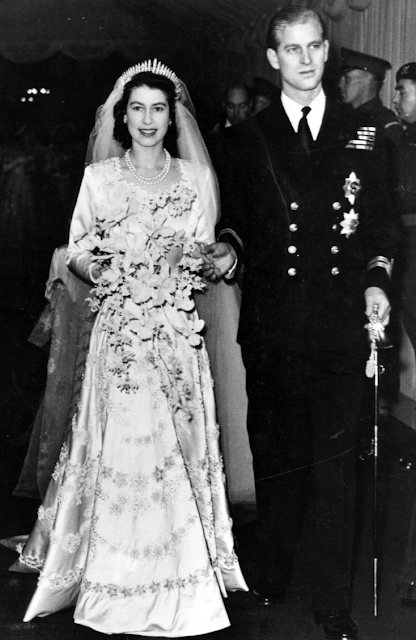 Queen Elizabeth ll on her wedding day. 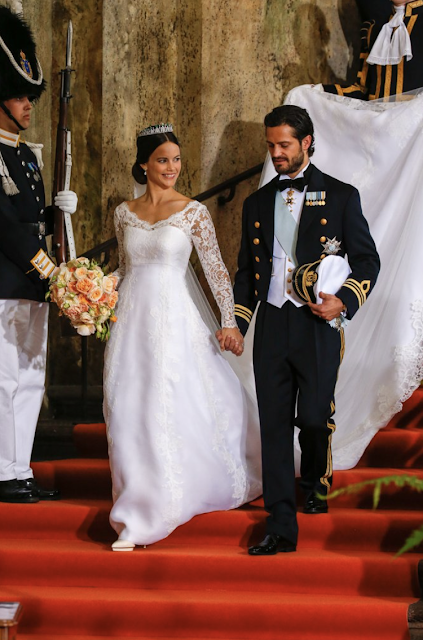 Princess Sofia of Sweden's beautiful wedding dress. 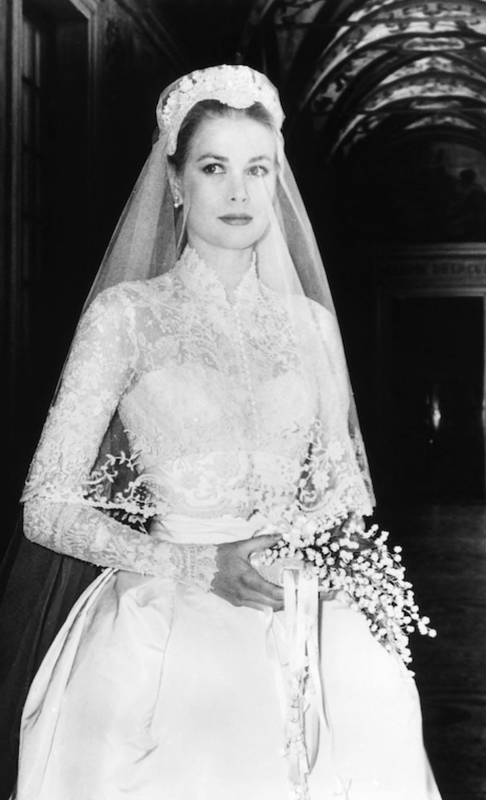 Grace Kelly on her wedding day. Her dress is timeless and stunning. The Duchess of Cambridge on her wedding day. She had my favorite royal wedding dress of all time. What are people saying about the bride's wedding dress? What were my thoughts on the fiery preaching? Who was the best-dressed guest? What was my favorite part of the ceremony? What marriage advice do we have to offer the newly married couple? Let's chat about all of these things in today's video. The cellist who played at the royal wedding, Sheku Kannah Mason, has a new album out called Inspiration . On the Chic Financial Principles for Debt-Free Living eCourse, Seema writes, "What a beautifully conducted course (both content and delivery)! It is so helpful to feel part of a community of like minded individuals. Though I know the freedom and security of debt free living/living below our means is worth its weight in gold it helps to know we are not alone in our endeavor. Sometimes the influence of “The Joneses” makes me question myself (are we being too stringent? Should we loosen up a little?) but this course has helped me reaffirm my commitment. My takeaway is that all things are possible and that embracing a joyful home life is so essential to not needing or wanting to spend on external entertainment. I’ve also been a devotee of the ten item wardrobe for the last 4 years and it is life changing. I never thought I’d love not shopping while adoring my wardrobe but I do. A hearty thanks to you for the inspiration and content you release into the world! You are making a positive difference in so many lives!" 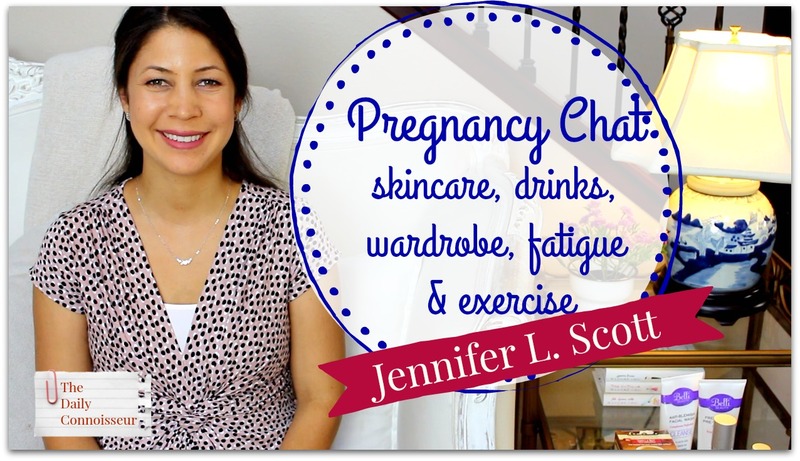 Regarding last week's Pregnancy Chat video, Debbie writes,"Hi, Jennifer! I visit your blog from time to time and enjoy it very much. I am a "woman of a certain age" that enjoys it when younger women like you find joy in the simpler (and more important) things in life like their children, their marriages, and making their homes places of order and tranquility. I admire your focus on making the life you have the best you possibly can and by not complaining about what you don't have, counting your blessings and sharing that positivity with others. Thank you for being a great role model for women and I hope that all goes well as you look forward to the arrival of your next baby." Debbie, thank you so much for your encouraging comment. I really appreciate your support and well-wishes. Did you watch the royal wedding? I would love to know your thoughts on all of the topics discussed. 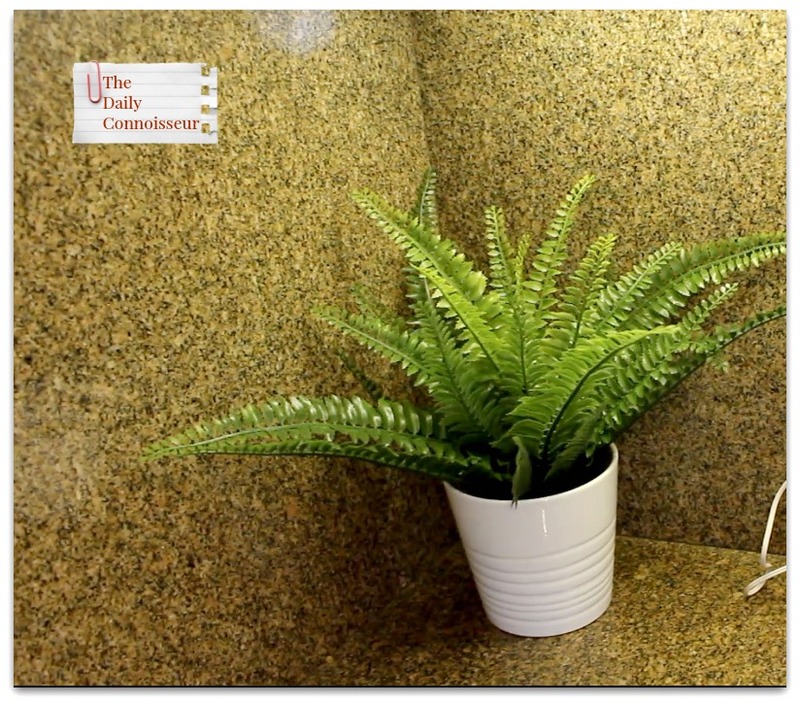 Leave your comments below and your comment could be chosen as comment of the week on The Daily Connoisseur. In today's pregnancy chat, I discuss the skincare I'm using, the drinks I'm enjoying, my maternity wardrobe, and how to deal with fatigue and exercise when expecting. 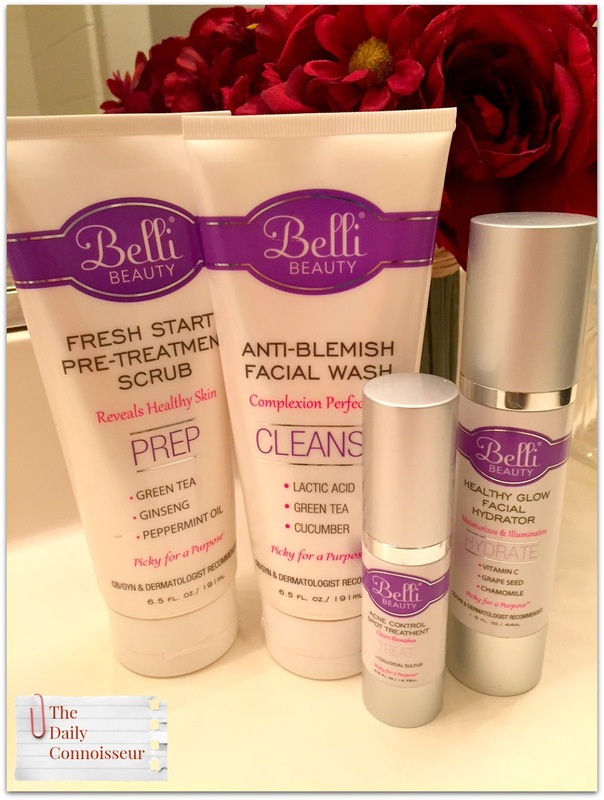 For skincare, I have been using Belli Beauty , which is a natural skincare line for pregnant women that is approved by both OBGYNs and dermatologists. The four skincare products I discuss in the video are Healthy Glow Facial Hydrator, Pre-Treatment Scrub, Anti-blemish Cleansing Facial Wash, Belli acne control spot treatment. For those of you who are not pregnant, and are looking for natural skincare, try Pellu Beauty (formerly Nudu). Also, the natural SPF line I mentioned in the video is MyChelle. The primary drink during pregnancy should, of course, be water. And I am trying to drink more water than I normally do to stay hydrated. As for special drinks, I have been enjoying one small coffee every morning (I usually make it iced). 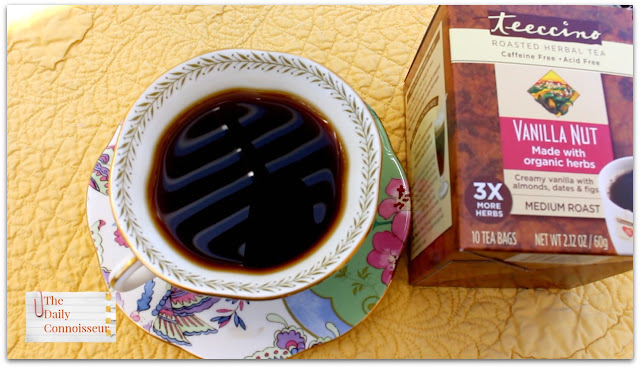 If I want an additional coffee or tea during the day, I drink Teeccino vanilla nut herbal coffee. I love the taste of this rich drink. Teeccino does contain chicory, so please ask your doctor if it is safe for you to use during pregnancy. I will do a maternity ten-item wardrobe video in the future, but until then, I have been enjoying my returning maternity dresses from Seraphine, mixed with new maternity pieces from zulily. In this video, I'm wearing one of the Seraphine dresses. Congratulations to the winners of the Ana Luisa Jewelry Giveaway: Kimberly G, Rowena M., and Natalie V.! I plan to watch the royal wedding this weekend, so look out for a special royal edition of Teatime with Jennifer on Monday. Get your teacups ready! 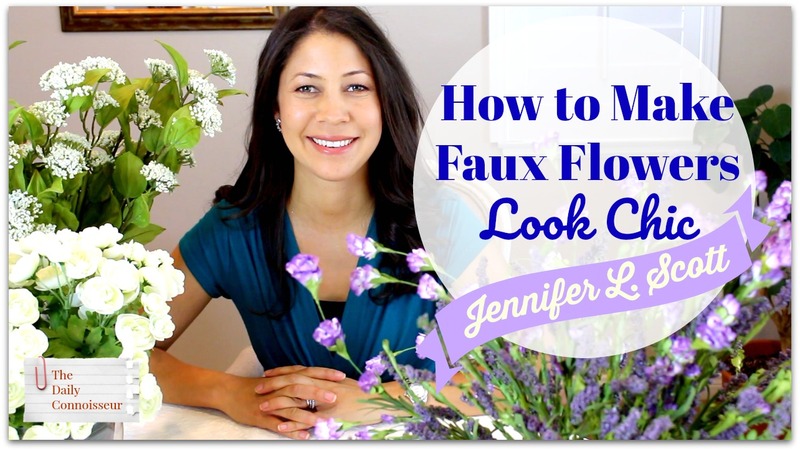 On Monday's faux flowers video, Silver Melody writes, "Hi Jennifer, Your faux flowers are really lovely. 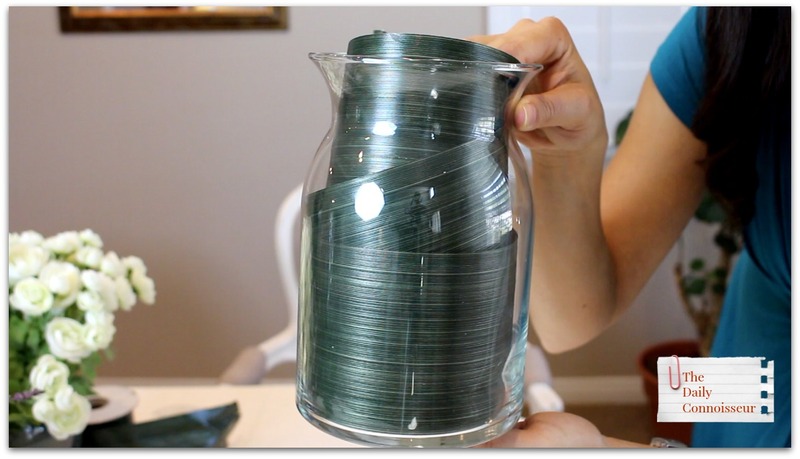 Another option is a faceted cut glass or crystal vase...the facets blur the stems very nicely. You can also add small clear glass stones to keep the flowers in place and add more light reflection. My personal favourite is a beautiful ceramic vase that hides everything underneath and lets you support the flowers with whatever means to get the best arrangement, and to my eye, the most aesthetic appealing option for real or faux arrangements.﻿"
That's a great suggestion, Silver Melody. Thank you for your great tips! I'll see you on Monday for a special Teatime with Jennifer: Royal Wedding Edition! In the meantime, I'd love to know your thoughts on the pregnancy topics discussed in today's video. Your comment could be chosen as comment of the week. See you Monday! 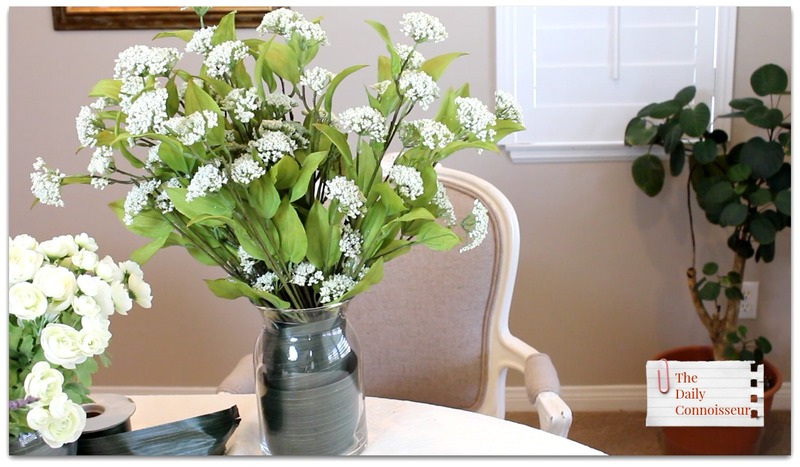 To cap off last week's home tour videos, I am sharing one way I display faux flowers to make them look sophisticated and even real. I like to use leaf ribbon on the inside of a clear vase to make the arrangement look like it came from a florists' shop. Of course there are many ways to display faux flowers. 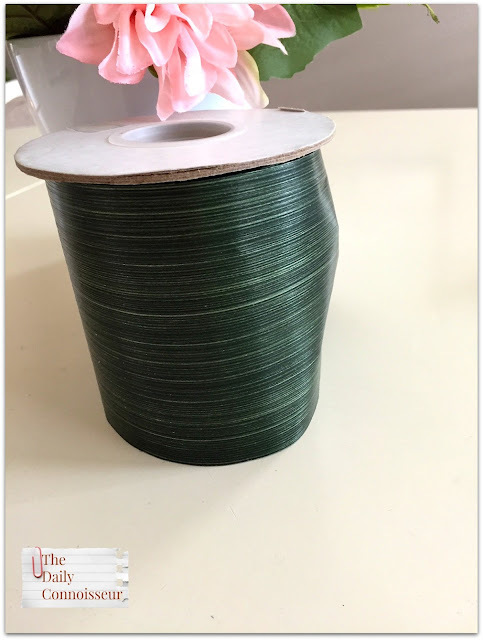 You can use glass pebbles , decorative opaque vases, and even acrylic water (which I have also done), but sometimes it's fun to use leaf ribbon to try to achieve the chic look from a florists' shop. I'm showing you how to use it in today's video with various vase shapes. I usually get my faux flowers from Hobby Lobby, Michaels, Amazon and AFloral. I hope you enjoy the tutorial in today's video. You have a few days left to enter my Ana Luisa Jewelry Giveaway. 3 lucky winners will receive the beautiful 'Olivia' earrings. Giveaway is for US residents only. Regarding last week's real and faux indoor plant post, DD writes, "I mix real and faux flowers in arrangements. A bunch of real lilies (inexpensive at the supermarket) in a big vase with several faux long, drooping stems of tiny orchid blossoms gives me an easy, beautiful, impressive arrangement for the entry or dining table. 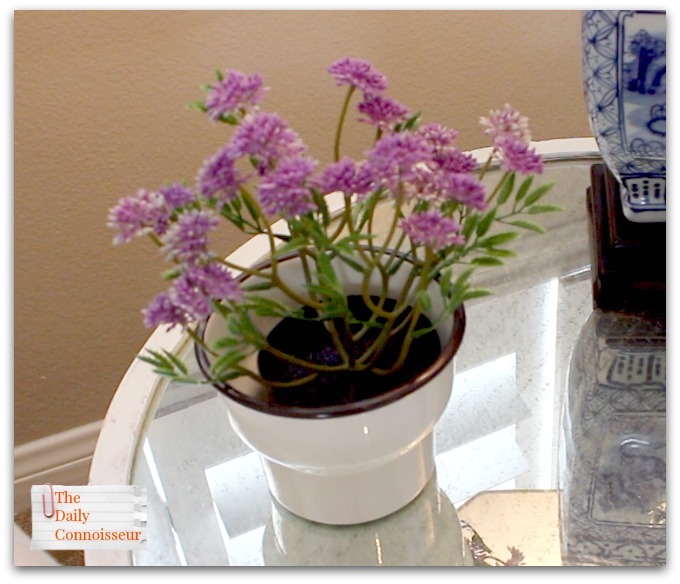 I've seen guests check them out and determine "real" when they see the lilies are real! 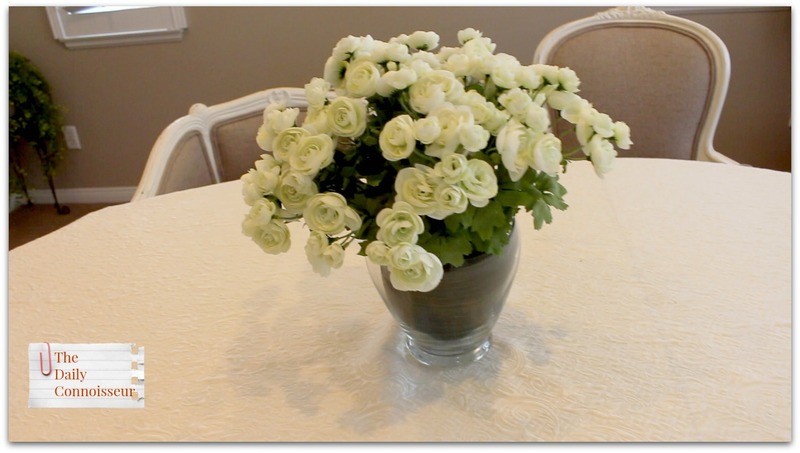 Economical, beautiful, and easier to arrange and take care of than a big bouquet of varied real cut flowers." Hi DD, what a great idea to mix real and faux in the same vase. I bet your arrangement looks spectacular! 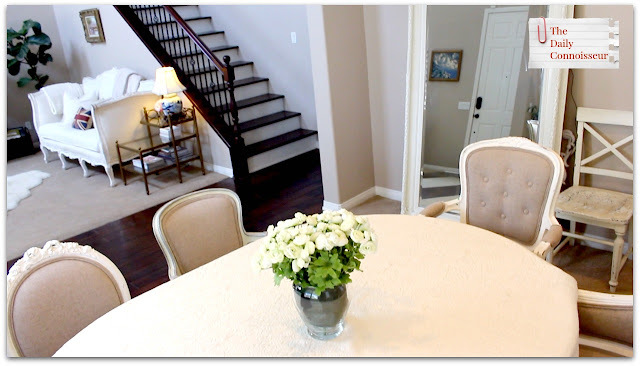 Today, I would love to know if you use faux flowers when decorating. How do you like to display them in a vase? Let me know and your comment could be chosen as comment of the week on the blog. See you on Thursday for a pregnancy chat video. 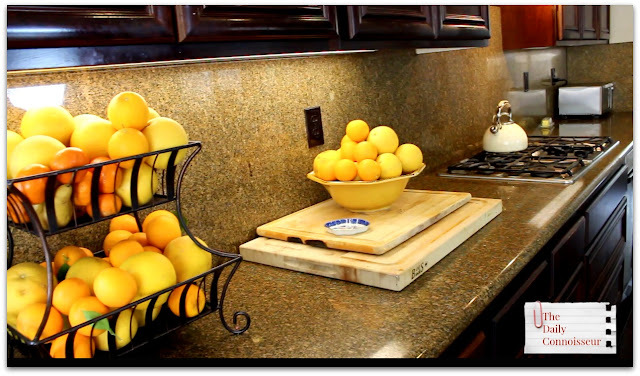 Thank you to everyone who watched Monday's home tour video. It was really fun to share our downstairs with you. Today, I'm discussing how we like to mix both real and faux indoor plants. We do this for a variety of reasons. 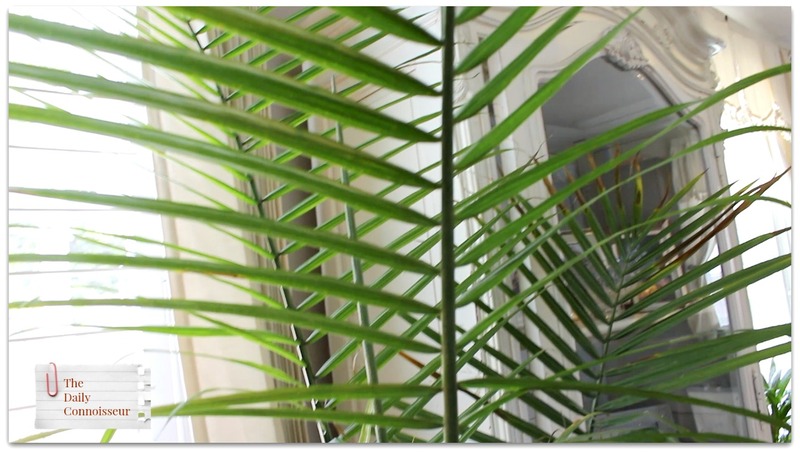 We have a six bedroom home, and because I like a bit of greenery and/or flowers in each room, I mix real and faux plants to keep maintenance down. Also, some rooms have less light than others and live plants don't work well there. 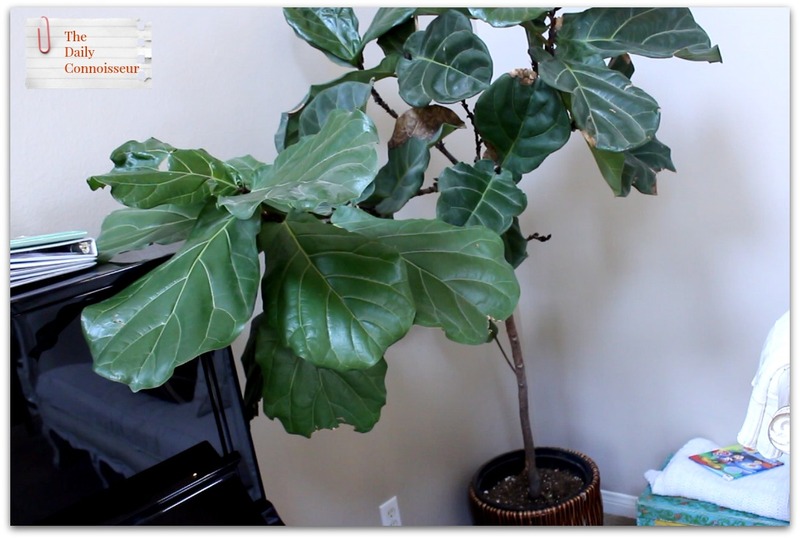 With the plethora of realistic-looking faux plants on the market today, it's easy to create a totally natural look. 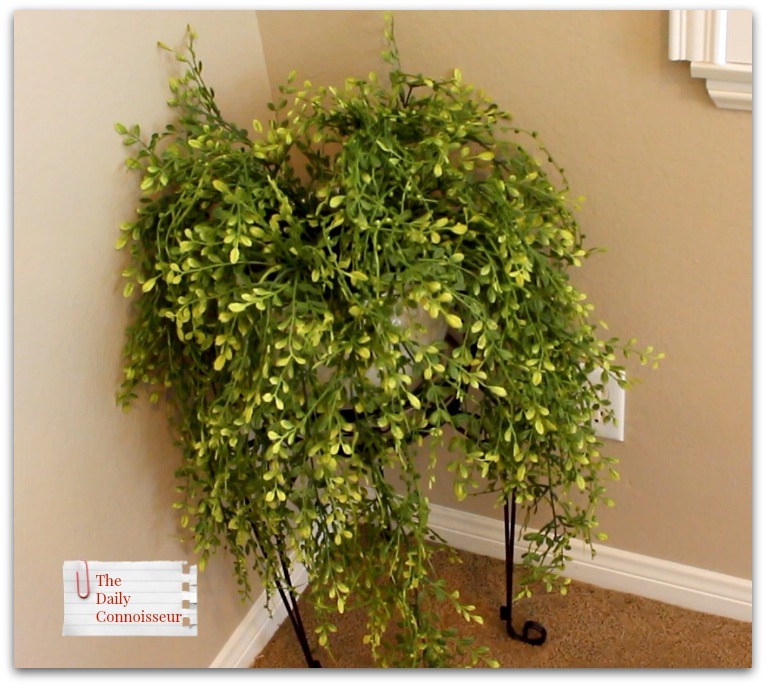 I have purchased many of my faux plants from Hobby Lobby, Ikea, Amazon and Michaels. 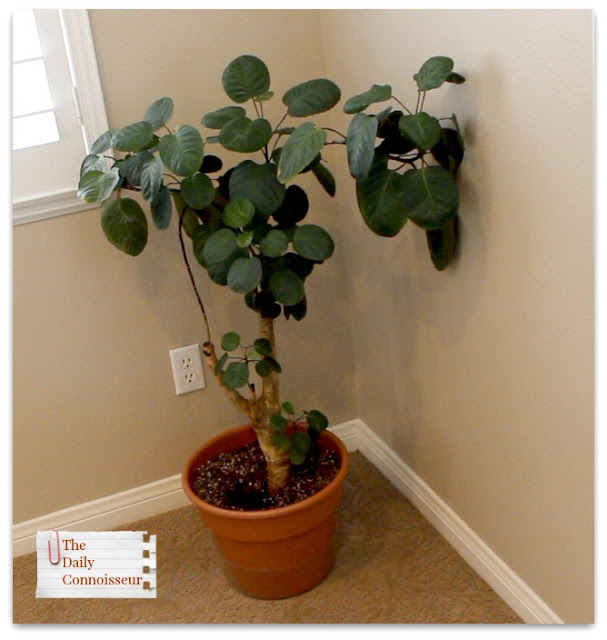 I do not show every plant we have in this video, but I do show you a large selection. 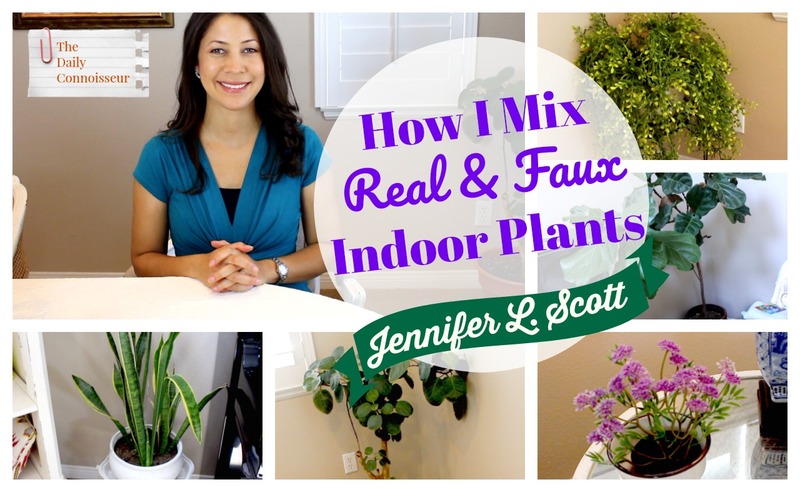 Be sure to watch the video to hear me discuss each plant in detail, including which ones are faux and which ones are real. If you'd like to see a part two to this video, showing our faux plants upstairs, please let me know. Be sure to enter my Ana Luisa Jewelry Giveaway. You still have time to enter. 3 lucky winners will receive the beautiful 'Olivia' earrings. Giveaway is for US residents only. Regarding the debt-free course, T writes, "Hi Jennifer,Thank you so much for this eCourse! Your blog and books have always resonated with me and this eCourse was no exception. I really appreciated your humility and realness. It felt like I was getting advice from a girlfriend which made it fun. The Investing and Entrepreneurship lessons were my favorite and gave me some much needed motivation. I want to say "thank you" to everyone who shared their stories and comments. I've always felt like the odd man out for being frugal. Knowing there are others on a similar path that are enjoying a debt free life and have found success with it is very validating and empowering. Thank you for all that you do and I look forward to what you have in store for us in the future!" Today's comment is a testimonial from Dawn, who wrote to me about her experience with a budget ten-item wardrobe: "Dear Jennifer, Your books have enhanced my life immeasurably! Thank you so much for everything, but specifically your video on the budget ten item wardrobe and your reply to critics. While I read that one should buy "the best quality you can afford", I mentally applied this as "I should be able to afford expensive items or not purchase clothing". Hence, I only bought one $100 dress over the past several months. Your response to critics finally made the true meaning of your original quote click for me, and it was so freeing! We just completed an international adoption, so expensive updates are not an option. After watching your video I purged some summer items and purchased two updates from Zulily and Amazon; for about $30 total! Thank you for living authentically! Blessings, Dawn"
Hi Dawn, congratulations on the adoption! I'm so thrilled that the ten-item wardrobe concept has worked for you in all areas, including budget. There is no shame in not having a large budget for clothes. It even causes you to be more creative than you normally would be. Thank you for being a supporter of my work. 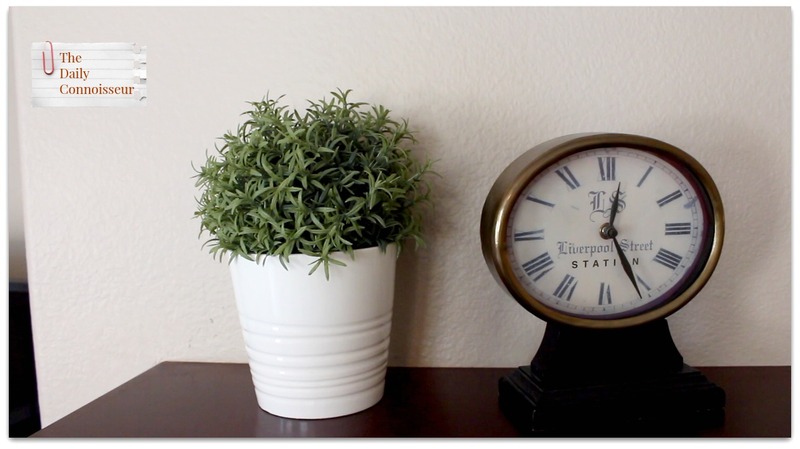 I would love to know... do you mix live and faux plants and flowers in your home? Why or why not? What are your tips and tricks? Leave us a comment and your comment could be chosen as comment of the week on the blog. See you soon! 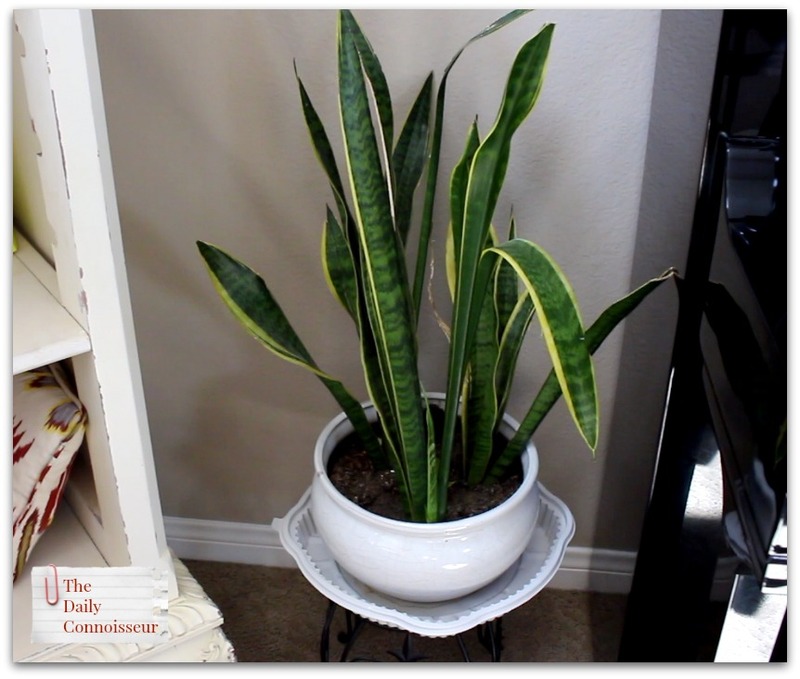 In today's video, I'm sharing a tour of the main downstairs rooms in our home: the dining room, living room, family room, and kitchen. This tour will give you a good idea of our style. We are very fortunate that much of our furniture has been handed down to us from our family in England and is of high quality. We like a neutral palette for our furnishings, walls, and floors. 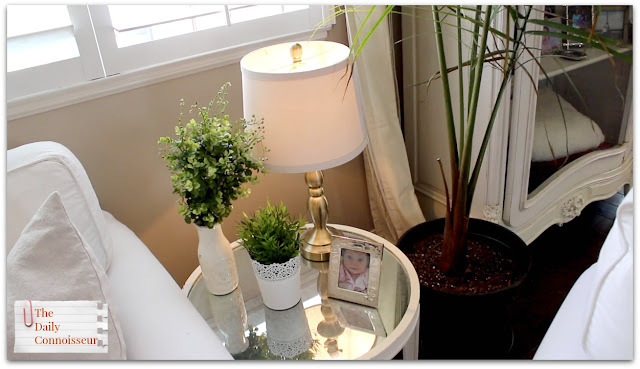 I then add pops of color with accessories like lamps, decorative dishes, plants and family pictures. Our formal living room is my favorite room in the house. 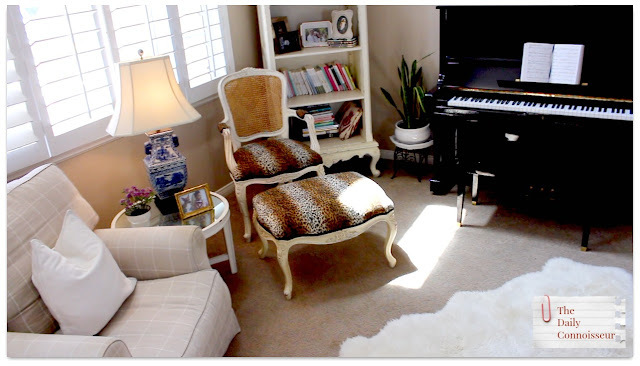 It's the music room, the game room and the room that we generally receive guests in. The comfy-looking checkered arm chair belonged to my mother-in-law, as did many pieces in this room. She has really excellent taste in interior design and much of this furniture was from a flat she once had in Santa Monica. The piano was a gift from my husband to me. We love our piano! The sheepskin rug is from Ikea. 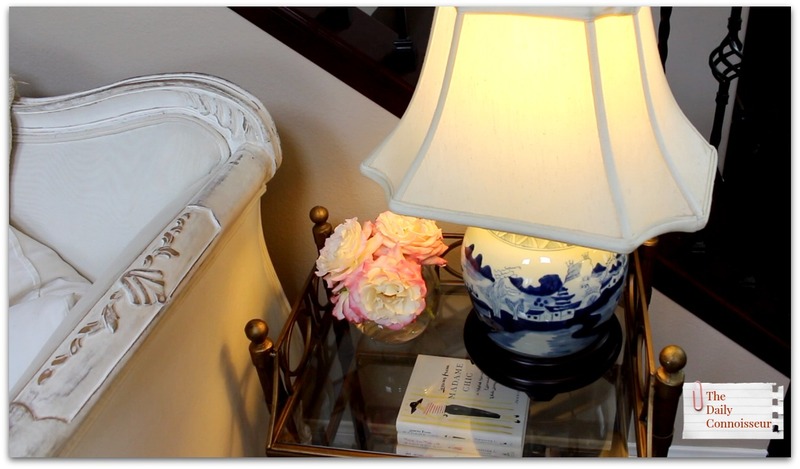 The blue and white lamps are both from eBay. The gold-gilded side table is from Ballard Designs. The Union Jack pillow was a gift from Ben's family. This coffee corner is located off of our dining room and directly in front of the pantry. The coffee, sugar, and tea canisters are from Amazon. How funny is the "Sorry for what I said when I was hungry" magnet? 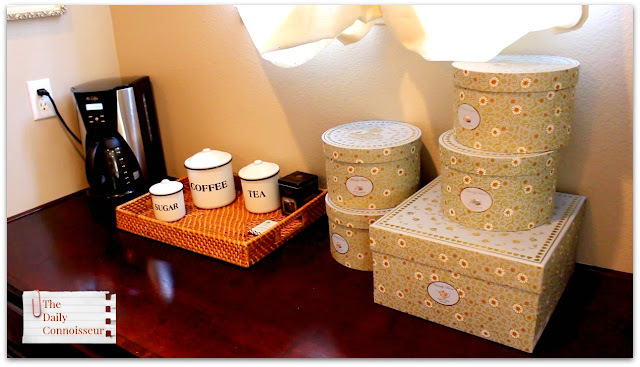 The decorative boxes are from a tea set that my mother-in-law gave us as a housewarming present. 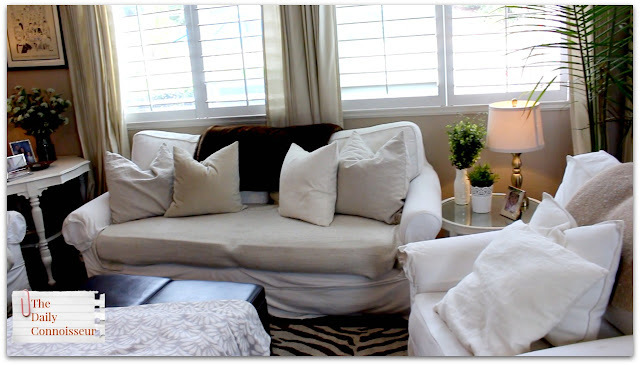 Our heavily-used family room is characterized by white slipcover sofas from Sofa U Love, a large zebra rug from Pottery Barn, and minimal accessories. 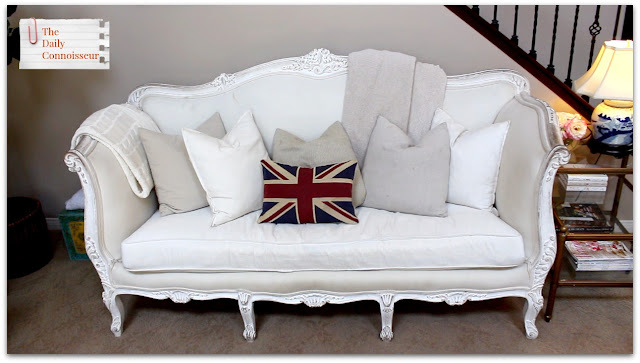 I often get asked how we keep our white sofas white. 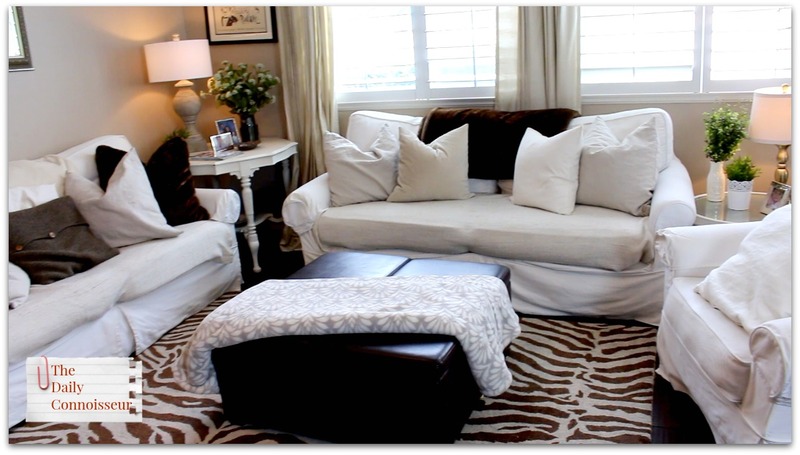 Because they are slipcovered, I can easily wash the sofa coverings to remove any stains. To prevent wear-and-tear, I place a throw blanket on top of the seated section of the sofas. We've had these sofas for nearly 10 years, and they have held up well. I like to accessorize them with neutral pillows and throw blankets in soft textures. Many of the throw pillows are from Ikea. 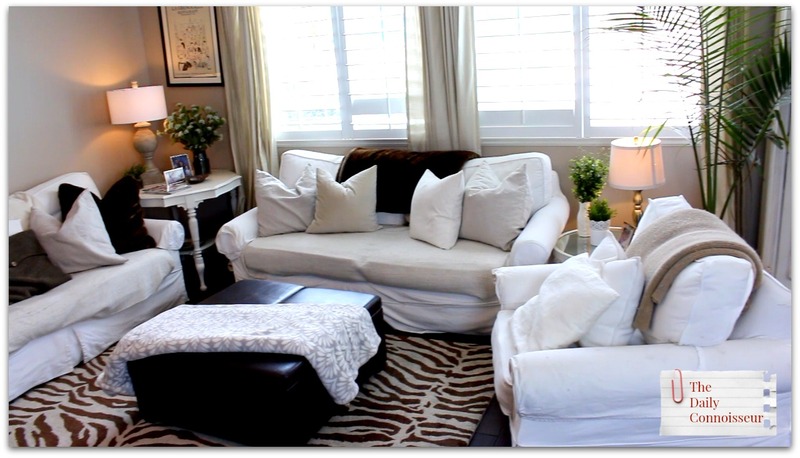 The faux fur pillows are from Frontgate. The ottoman is from Costco and has storage inside. This is where we store some of the toys the baby plays with. The large lamp is from Home Goods. The small lamp is from Ikea. Finally, we come to the kitchen. 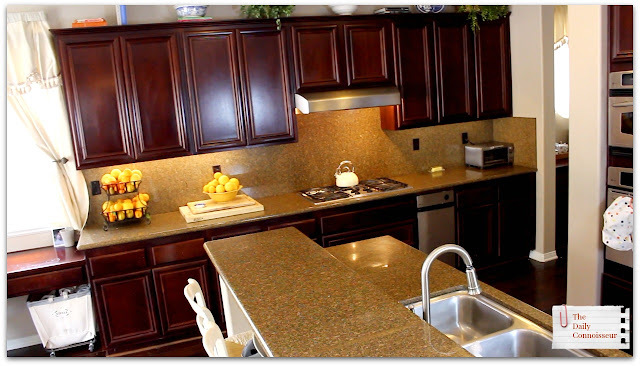 It has taken me some time to get used to the darker colors in this kitchen, namely the countertops. 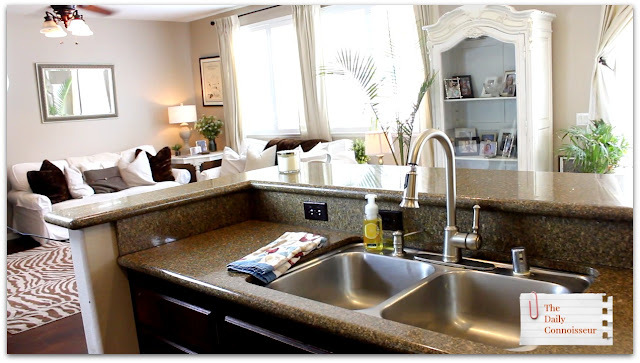 I have always enjoyed white, cream, and grey in our kitchens from our previous homes. But since we do not have the budget to redo the kitchen, I am focusing on what I love about it. I decorated the tops of the cabinets with vintage cookbooks, china dishes and bowls, faux plants, and baskets. 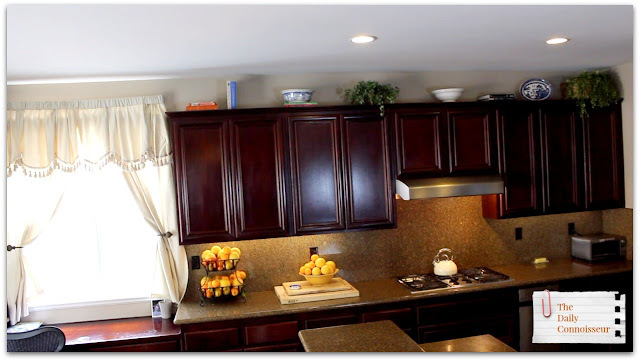 I like to keep the kitchen very functional and utilitarian as I am in there so much cooking meals for the family. I like to keep the countertops as clear as possible. 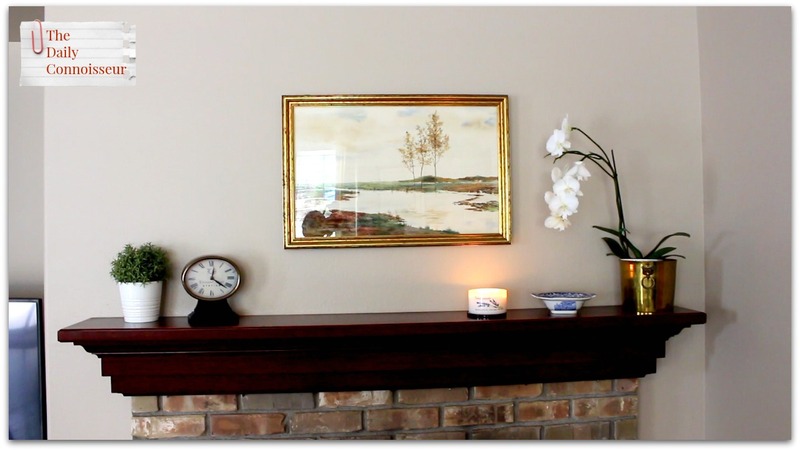 While our home and decor is not picture-perfect, we have really enjoyed decorating our space and making great use of the items that have been handed down to us. 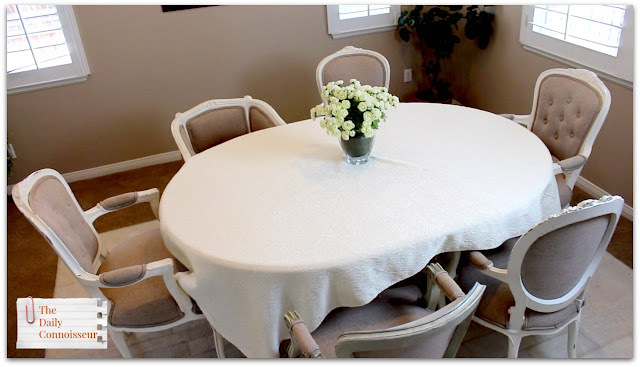 There are many decorating projects I would love to do as our budget allows, but many of them will have to wait. In the meantime, we are enjoying our space as it is. Kavitha writes, "Thank you Jennifer for this encouraging, well put together lesson. We have never been outlandish spenders but at the same time never been out of debt either. Our debt is manageable but i have always wanted to be debt free. You have provided some great ideas in this course for us to try and hoping the vision of debt free life will come true. I also want to thank you for sharing your story to be an inspiration. It takes courage to do that especially in this world of quick judgements and narcissism. Keep up the good work. Wish you all the Best!" Hi Kavitha, I am very excited for you and your family to become debt-free. I'm so happy you enjoyed the course! Janis writes, "Hello Jennifer, my husband and I are debt free, so why am I taking your course? Because we are on the brink of retirement and this is THE time in life to be careful with money when on a reduced income. So I am enjoying your course and getting good ideas from it. Many thanks." Hi Janis, congratulations on being debt-free! I think it's so wise that you are making financial fitness a priority in the later stages of your life. I'm so happy you are enjoying the course. 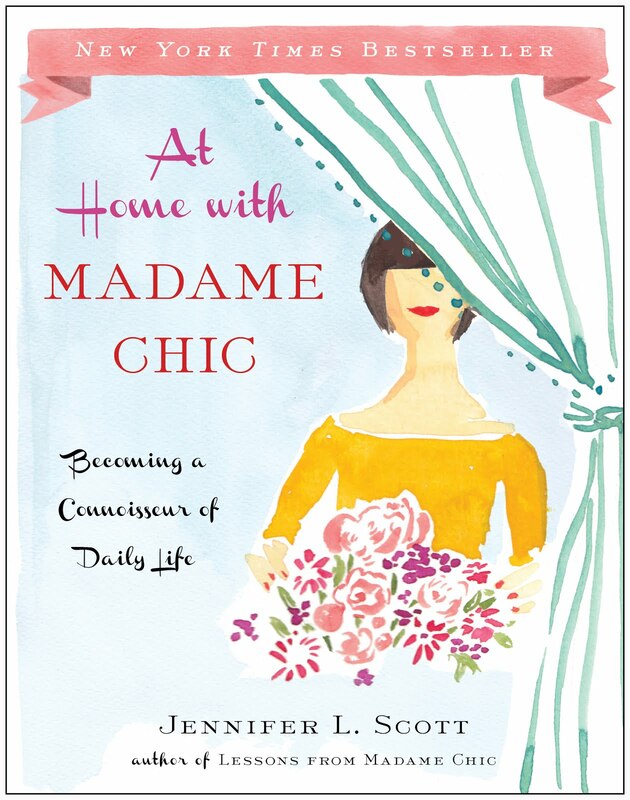 At Home with Madame Chic is a perfect book to get you motivated for spring cleaning. I enjoyed your live-chat-video and want to thank you for it. It is always so much fun for me and a pleasure to hear you talking and giving good advice. I think you are really courageous to putting yourself out there, especially with troll people trying to do their damaging work. That is one of the reasons I comment here, just to be one of the other and supporting and thankful voices. I am so grateful that you put the live-chat-videos online afterwards because like this we are able to review them whenever we like. Also, I'm in Germany and both times I didn't have time to follow the chat live and was so happy that I didn't miss them entirely. (Also, I have to admit that I am not an Internet-pro and wouldn't really know how to follow a live-chat on air). Thank you for your wonderful work. I wish you all the best with your pregnancy and send you good wishes from Germany. Inga"
Hi Inga, your support means a lot to me. Thank you for your kind comment. All you need to do to watch a live chat is be on YouTube and watch the video as it is live. If you are subscribed to my channel, and receive notifications for when I upload, you will know when I am going live. I also try to announce future chats on Instagram, twitter and Facebook (links below). To receive notifications from my YouTube channel, you click the "bell" icon next to the subscribe button. You will be emailed every time I upload a video. You are then able to type in the chat section and I am able to respond to you in real time. I hope that helps! Thank you for joining me today. Please let me know if you'd like to see more rooms in our home. I would love to know how you characterize your interior design style. How do you like to style your home? Let me know, and your comment could be chosen as comment of the week on The Daily Connoisseur. See you on Thursday!